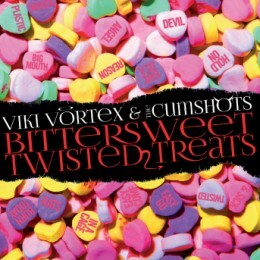 Welcome to my review of Viki Vortex & The Cumshots lastest release “Bittersweet Twisted Treats”. I was very on the fence about this release when it was announced, it wasn’t until i had read a review about the album that i decided to take the plunge & order the album myself. For myself it isn’t until very recently that i have been exposed to female fronted punk bands, i knew about them but for some reason i never found myself drawn to any of them. This for me changed when i was given a copy of PissAnt’s album “Speak Up” & was backed up by the fantastic dragSTER album “Here Come The Meat Robots. So now i have the album & have listened to it all the way through a considerable amount of times i am going to review it for anyone still on the fence about this album. My very first thought about the album is that it starts in a very grabbing familiar way, i say familiar as in that it doesn’t daunt you from the first track. 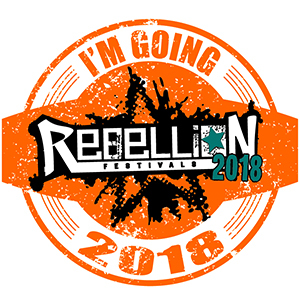 Consider “Hold On” the official welcoming to this release it’s a fantastically tight track with a brilliantly catchy chorus, thrashing bass, kicking drums & shredding guitar. It’s a nice show of Viki’s vocals which i find only get better throughout the album. Following this we have a few quick tracks to thrash through your ear drums “Big Mouth” “Give Us A Reason“, Big Mouth has some fantastic vocals, bit of screaming & is a pleasure to listen to. Give Us A Reason i found didn’t really make too much of an impression with me on any play through of the album. I didn’t find it as catchy or attention grabbing as the song that came before it. The next couple of songs up start with “Plastic Fantastic“, this song has an amazing bass line pulsing all the way through it, lyrically it’s brilliant same with the vocal delivery but the Bass takes the award home with this one. “Easy Come/Easy Go” is up next, slightly slower than the tracks that came before it but don’t take this as a bad thing. This track is incredibly catchy & would be a track i would use to define this band. The music is tight & is a shining example of the vocal range of Viki. “Burn Today” kicks in with an aggressive assault of guitar, drum & bass. It instantly grabs you & demands attention, fantastic track musically. The lyrics are catchy & once again Viki is vocally sound, i have found myself singing along with this one a fair few times. “Rat in a cage” kicks in very quickly, not a bad little number unfortunately i just didn’t really feel this track. Everythingis sound in this song it just has the misfortune for me to follow “Angel Or Devil” so it had quite a high standard to stack up with. The final track of the album is “Twisted & Sick” this here is a fantastic track & ends the album on a very high note,another little bass number to win me over, Viki is once again vocally brilliant on this track. The backing track keeps you interestedwith a brilliant guitar track & spot on drums. Over all this release is a fantastic bit of music, quite a short listen with the longest track being at 2:34 & it being 9 songs long,i find this to be a good thing as occasionally an album can go on too long where as Viki Vortex & The Cumshots finished at the right time for me. The vocals are crisp throughout the album as are the instruments, some brilliant lyrics push the album along & it is helped along with some infectious chorus bits you will sing along with over & over again. The high points on this album are “Angel or Devil“, “Plastic Fantastic” & “Hold on“. We have 2 examples of what i consider the finest tracks on this release & the brilliant first track which gives you an idea of what is on offer here. Lows points are that there were a few tracks that seem to fire by & didn’t leave much of an impression with me, overall i enjoyed the speed of the songs on this one but i think on the next release i would really like to hear the odd song a little slower & really show off that vocal range!. Buy, Stream or Avoid. BUY!. This is a brilliant punk piece & Viki Vortex & The Cumshots should be proud of what they have released. A catchy lightning fast number which will see you through many a play though.